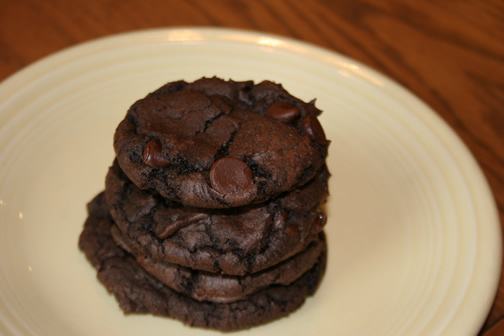 These are the most amazing chocolate cookies you will ever taste. They are soft and chewy and melt in your mouth. The batter looks very similar to brownie batter when you are mixing them. Mix ingredients and scoop onto a cookie sheet. Bake 350 degrees for 8-10 minutes. Cool on cookie sheet for 1 minute and then remove to cooling rack. My mouth is watering. You've got some great recipes on this week. I love myself some hashbrown casserole! I just did something similar with banana cake mix and chopped up fruit slices. (I am creating from my pantry) Everybody loved them but these chocolate ones will take them over the top. Thanks for sharing your quick delicious recipe. In college we called these "Better than S**" cookies. I made these early this morning, they are so yummy. My cookie dough came out thick, so that it could be rolled into cookie balls. After melting the butter in a sauce pan, I put it in the fridge to cool for a few minutes, then mixed up the batter. Just wondering if I should've done it differently. I don't think you did anything wrong. The batter is very thick and looks like brownie batter.